The 3 Season Jersey has a stripe made up of reflective dots running vertically down the back. Thankfully the days of using bin bags and newspapers to weather-proof cycling gear are long gone and we’re now at the stage where there’s something for every conceivable weather condition. This is great but it does tend to present its own problem - namely that with such an abundance of choice, what do you wear, or probably more accurately, what do you buy? It might at this juncture be wise to consider your choice according to the variety of conditions you might find yourself in and that’s where something like the Ashmei 3-Season Jersey becomes an option. It’s a very capable piece of kit; water resistant, windproof, breathable, everything you need for those rides where the weather is giving you no clues as to what it’s got in store for you. This kind of jersey can trace its roots back to the Castelli Gabba, which was developed by the Italian brand following a suggestion from Norwegian pro rider Gabriel Rasch. It was Rasch who switched the brand on to a new way of thinking for apparel - that when it came to wet weather protection, breathability trumped full waterproofing. In other words, it is better to have a jersey that allows a rider’s sweat to permeate through the fabric and possibly a little water in than to use a fully waterproof fabric that allowed no perspiration to escape and resulted in an uncomfortable ‘boil-in-the-bag’ scenario. The Gabba, and the category of jerseys it spawned, is made from a soft, breathable fabric treated with DWR for water resistance. Ashmei’s 3 Season jersey owes more in appearance at least to Rapha’s Shadow Jersey, which was developed to be a competitor to the Castelli garment and benefited from technical input from Team Sky. As with the Shadow, The Ashmei 3 Season Jersey is made from a woven stretch fabric with DWR coating the thread itself, negating the need for a membrane. Thus you get a jersey that performs as a jacket and could almost make you want to go out riding in the wet. It’s certainly a pleasure watching the rain bobble and bounce off it. Also in line with the Shadow, it has a light pile on the back of the fabric to keep you a bit warmer, although something for riding in extreme cold this is not and it does have its temperature limitations. Our first outing in this was in a -4 degree windchill, which proved too much. After about an hour of riding, an insulated gilet had to be deployed. But in anything down to four or five degrees you’re going to be OK with nothing more than a light base layer underneath. Don’t forget the short sleeves though, which means you’re going to need thermal arm warmers. 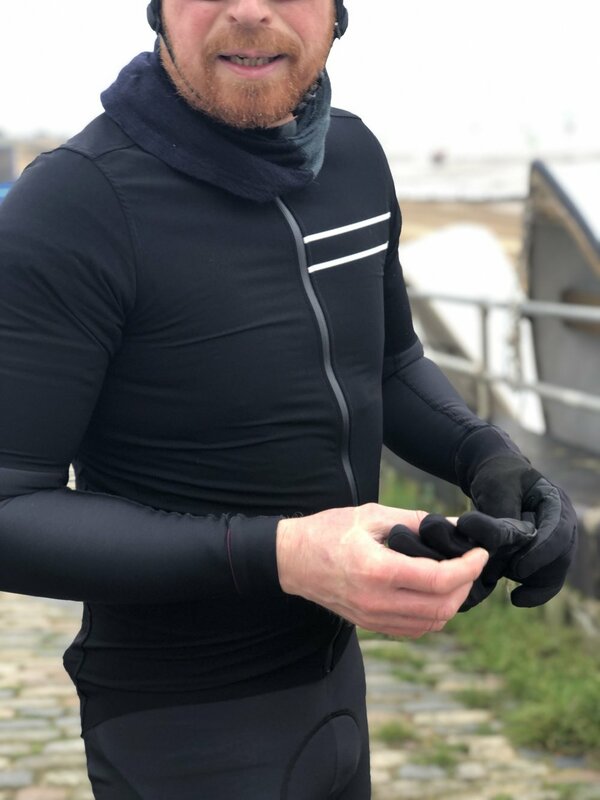 Those sleeves are in fact a good indicator of suitable riding temperatures for the Ashmei 3 Season Jersey, because this is not a deep winter jacket. This is for cool, wet rides from early spring right through to early summer, and the same with Autumn. Riding in temperatures up to the mid teens is going to be fine in this. Which doesn’t really leave a lot of the year when you can’t wear the Ashmei 3 Season Jersey, and that’s a good thing. Right now you might bemoan the fact that it’s often a bit too cold to wear it but give it a couple of months, when it’s hacking down in spring and you won’t leave it alone. In terms of appearance, this indeed looks and fits just like a jersey and is intended to sit next to the skin, or base layer. It has a waterproof zip to the front and a very reassuring vertical reflective dotted stripe running down the centre of the back. The pockets are incredible, flush when they’re empty yet capable of taking a fair amount of load and the exaggerated drop of the tail is a godsend for making sure the rain doesn’t get anywhere near your backside. One thing to consider with the Ashmei 3 Season Jersey though is that it is designed for high-tempo riding by stick-thin cyclists. It is therefore ridiculously close fitting and cut for those of us with nary an ounce of meat on our bones. If you are carrying even a shiver of timber, size up or be prepared for some compression. That aside, this is quite simply a stunning rain jersey. Ashmei have a background in creating technical clothing to exacting standards and this is true to form in that respect. Seams are welded to eliminate potential water ingression points and hems are finished with laser cut raw edges so they sit flush to the body, allowing next-to-skin comfort or ease of use when wearing a base layer. All of this combines to make it possibly the most comfortable option in this segment. Summary: There are a few rain jerseys to choose from these days and all occupy a similar price point. Ashmei’s offering is more than a viable option and features superior standards of comfort and manufacturing. Rain will not be an issue when wearing this, but despite a soft fleece backing, temperature might, so don’t go too low. This is, however, perfect for its intended environment, which is spring downpours but unless you are a stick-thin pro, size up.